COMING SOON "THE COACH JERRY AUTOBIOGRAPHY"
YOU WILL FIND OUT WHAT MAKES COACH JERRY THE MOST HATED MAN IN BASEBALL. ALSO, HE IS THE COACH THAT MOST PEOPLE WANT THEIR CHILD TO PLAY FOR. CAN'T FIGURE IT OUT ? CHECK BACK TO THIS PAGE SOON FOR THE FULL AUTOBIOGRAPHY ON COACH JERRY. GOOGLE COACH JERRY, BAYSIDE COACH JERRY ,OR COACH JERRY BAYSIDE FOR ALL ARTICLES . Meet Coach Jerry Costa. If you wanna see terrific baseball in the Borough of Queens, come see Jerry’s Bulldogs, a team of 12-year-olds who play for the pure love of the game. Without $100 million contracts, $75 nosebleed seats, $7 hot dogs, $9 beers, $20 parking and a business plan connected to the greatest Ponzi artist in American history.Costa is an intense, compact, red-haired night postal worker and pure old-school New York character from the gritty streets of College Point. Costa coaches in loud, gruff capital letters with a priceless New York accent, blurting brilliant malapropisms like wishing “Muscle-tuff!” to a Muslim getting married.Instead of mangling the multiethnic surnames, Costa dispenses nicknames like Ace, Iceman, Crusher, Boomer. And spouts trademark slogans: “Dummy up, this ain’t no play date!” “This ain’t a union meetin’.” “Pick up dem balls!” “It ain’t rainin’ till I sez it’s rainin’.”Full disclosure: My son has played for Costa’s in-house Bayside Little League teams, BLL summer travel teams, and on the independent Jerry’s Bulldogs.Fuller disclosure: When I first met Costa, I didn’t like him. Many still don’t, but usually because they don’t know him well or if they do, because he refuses to start their kid at shortstop every game. But he barks equally to every kid, never favors his own son, and in three years, I’ve never once seen him argue with an ump.What even his archenemies can’t deny is that Costa is the smartest, hardest-working, most-organized volunteer coach in Queens, managing 20 teams in eight years, winning 16 “championships.”“Some coaches hate me because I learned a wicked work ethic in my old man’s body-fender shop and discipline in the Navy during the Vietnam War that makes a lot of them look lazzzzy, see,” Costa says. “And because my teams usually win, yeah? Not because I’m a great baseball mind. Matta fact, I don’t know a lot about baseball. They win because my kids are prepared and because I’m not afraid to tell precious Junior that he’s la-zzzzy with a capital Z when he don’t give me 100%. I’d rather have nine mediocre kids who give me 110% than nine spoiled superstars who refuse to run out a popup top speed, yeah?”Last year, Costa’s in-house BLL team had 16 games and 27 practices. “Sore losers called us the IHOP team, insinuatin’ we were stacked,” Costa says. “We had lotsa talent, but we won the championship because we worked harder than everybody else, see. That PO’d people. That’s why so many people come to watch my championship games. They line the outfield fence like buzzards droolin’ for me to lose. I love it! Being hated motivates me, see. I’ve had equipment bags thrown at me by parents, my chest poked, one 6-foot-4 father crossed his fingers in fronna my face, screamin’, ‘Skull and bones, Costa! You horrible little man!’ I liked that there one so much I put it up on my website, see.”Costa’s summer travel team last year suffered because some of BLL’s best kids joined a rival league. 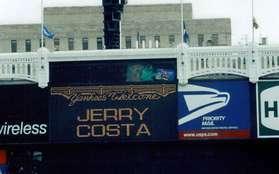 So Costa formed the independent Jerry’s Bulldogs, which went 26-0 in the fall, winning three tournament championships in Bethpage, College Point and Oceanside.“Then Jerry’s Bulldogs practiced every Saturday morning in Bayside Batting cage,” Costa says. “We’re ready, yeah.”“You wanna see some pure baseball in Queens, check my website, see,” says Jerry Costa of www.jerrycosta.com, the perfect antidote to the Madoff Mets. :Do not compare your child’s ability to another child’s ability, but compare your child’s own ability from his first practice to his last game. Parents are parents, so leave the coaching to me and my staff. Parents, do not disturb me or the game !! Do not ask, “Can my son play [a certain position]?” It is my choice, based on skills, safety and game situations. Dugouts are not playpens. Every child is expected to pay attention to the game and to cheer on their team mates. Goofing around will result in your child being asked to leave the dug-out! If you get hurt, you can cry for 5 or less seconds. If you bleed, you can cry for 8 or less seconds. Otherwise, there will be no crying on this team ! I do not care if we win or lose a game ! What matters most is that your child gives 100% to the game and to his team. If he gives 100% , regardless of his talent, he will be a winner, not just in games but in life. You heard it from Coach Jerry himself. "I am full of myself." So now you don't have to pass rumours around.